A cute hanging bunny made from CD discs, chenille strips, google eyes and pom-poms. What could be simpler and also a way to use old CD discs. These go together quickly and because the eyes, mouth and whiskers are put on by the kids, the resulting bunnies will have different appearances. I used pink pom-poms, but I think other pastel colors would be cute too. Any class can make these bunnies, so you’ll find the directions for “CD Bunny,” in the Easter Projects Gallery in the sidebar. 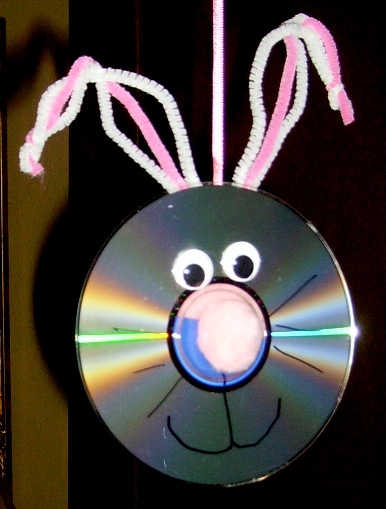 This entry was posted in Easter and tagged bunny, cd bunny, cd crafts for kids, cd easter crafts, easter bunny crafts, easter crafts for kids, easy cd crafts to make, hanging bunny, hanging cd bunny, hanging easter crafts. Bookmark the permalink.